My girlfriend bought a baby sulcata from a reptile swap for $65 and he looked pretty good when we got him. He was about 2-2.5" in diameter. As time went on, he got less active and less hungry. Also hasn't grown at all (been about 3 or 4 months maybe a little longer). She took care of him like a baby, everything from vitamins to uv lighting and a huge cage. When I went to soak him, I noticed he was dead. Turned him over and his shell has a black bruise looking mark (about 1 cm) and the bottom of the shell is pretty soft, softer than when first bought. She's going to be devastated when she gets back from work, but I was hoping to get an idea of what may have happened, as we cannot afford a vet visit right now. Comments for Baby sulcata bruised? We bought him at a reptile swap. When we went back, the guy was gone, as well as his turtles. If he was there, I would have said something for sure. We got a baby sulcata from a pet store and he was sick as well. We took him to the vet at the first sign of trouble and he seems OK now. If they are mistreating turtles at that store you should report them. Who knows how many more turtles will suffer or die if you don't. So i just went back to where i got the tortoise from and ALL of them are gone...im guessing they all died because the seller didnt take care of them. and also someone there told me the babies too should be alert and moving around, didnt know that when we bought him, but at least we gave him a few good last months here on earth. Yes it has vitamin D3 in it. Does the calcium powder include the vitamin D3? He had calcium powder, uvb lighting (not the cheap stuff either) and basking lamps. everything he needed. i think we bought him sick from the reptile swap, only thing i can think of. 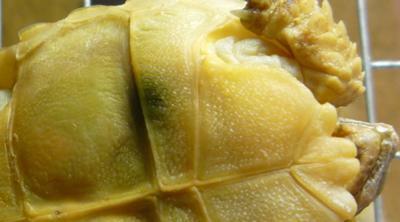 The soft shell is usually because of a lack of calcium. A tortoise needs UVB light to metabolize calcium. Is that what you had? I can't account for the dark marking on the plastron. He went outdoors about once to twice a week (we live in chicago so a nice day is tough to come by this time of year). I don't know if its mold unless it's growing under the shell. She gives him calcium powder and multivitamin powder and alternates them each day. I noticed he wasn't eating as much, but she insisted he was eating well. but he would lay around a lot more unless we put him in his soak tank, then he'll walk around. Honestly, I am unsure. Could it be that the bruise looks like a mold or fungus of some sort? Did he noticeably quit eating and being active as much? Did he get much outdoors time? Did the vitamins she feed have D3 included?